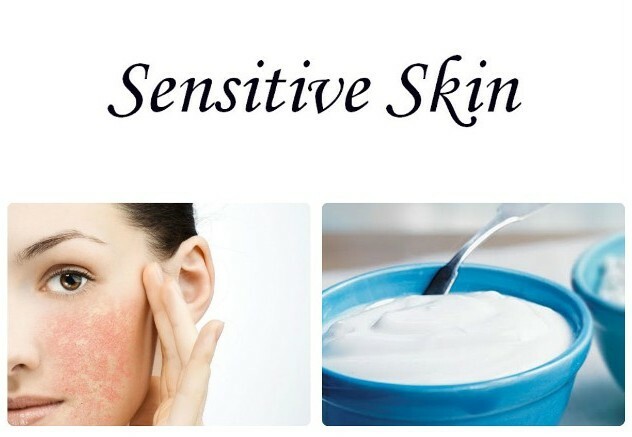 If you have sensitive skin, it is very likely that your skin will get red easily due to external factors such as in contact with certain skin care products, household products. Highly sensitive skin can also happen due to skin disorders or allergic skin reactions (such as eczema, rosacea), overly dry skin or skin that is damaged due to excessive exposure to sun and wind. When comes to treating sensitive skin, you should use moisturizing products to help the skin retain moisture to overcome the dryness and abrasion. You should also avoid any products that contain alcohol and alpha-hydroxy acids. Following are some recipes you can use to create a homemade face mask to treat sensitive skin. To prepare this mask, you need half a cup of finely grinded oatmeal, half of a ripe apple and half of a cucumber. Cut the apple and cucumber into small chunks and put them into a blender with the grinded oatmeal. You blend these ingredients into a smooth paste. You can apply this mixture evenly to your clean face and neck, keeping clear of the eye area. You let the mask stay on your skin for up to 15 minutes. When the time is up, you rinse off with lukewarm water and follow by cold water to close up the skin pores. You wipe your face dry with a cloth and put on some moisturizer. To prepare this mask, you will need half of a ripe avocado, 1 tablespoon of extra virgin olive oil and 1 teaspoon of apple cider vinegar. The first thing you need to do is to peel and mash the avocado. Next you add in the olive oil and vinegar to the mashed avocado and mix them well to form a paste. You can apply this mask all over your face, neck and on other dry areas of the body (remember to keep clear of your eyes). You let the mixture stay on your skin for up to 15 minutes before you wash off with lukewarm water and follow this with cold water to close up the skin pores. You dry your face with a towel and put on some moisturizer. To create this mask, you need 1 tablespoon of oatmeal, the contents of a chamomile tea bag and 1 tablespoon of extra virgin olive oil. You mix the ingredients well in a blender or food processor, or you can stir the ingredients well with a spoon until you get a nice and smooth paste. You can now apply the mixture on your face and neck and let it stay on your skin for at least 15 minutes. When the time is up, you wash off the paste with lukewarm water and then with cold water to close the skin pores so that your skin won’t get dry. You wipe your face dry with a soft towel and put on some moisturizer. This mask is gentle enough to use every day and it can also be used to reduce more severe rosacea flare-ups. To prepare this mask, you need one quarter cup of water, 2 teaspoons of dry milk powder, 1 teaspoon of cornstarch, 2 teaspoons of raw organic honey (or manuka honey) and 1 tablespoon of extra virgin olive oil. You mix all the ingredients together in a bowl until you get a smooth paste. If the paste is too thick, you can add a bit more water. After you get the spreadable consistency of the paste you can apply this on your face, neck, arms and other parts of your body that are affected by sunburn. You let the mask stay on your skin for up to 15 minutes. When the time is up, you rinse it off with lukewarm water and then with cold water to close the skin pores. This will help to retain moisture in the skin. You dry the washed area with a towel and apply some moisturizer. To prepare this mask, you need 1 potato, 1 egg yolk and a 1 tablespoon of milk. First you boil the potato until it is soft and then you mash it up. Then you add in the egg yolk and milk to the mashed potato and mix them well to form a paste. You can now apply this mixture to your face and neck, while keeping clear of the area near to your eyes. You let the mask remain on your skin for up to 15 minutes before you rinse off with lukewarm water first and follow this by cold water. You do this to close up the skin pores so as to retain moisture in the skin. You wipe your face dry with a towel and put on some moisturizer. To prepare this face mask, you require 1 cup of organic plain yogurt, half a cup of oatmeal and 2 tablespoons of raw organic honey (or manuka honey). You mix all of the ingredients to form a paste which you can apply on your face and neck, while avoiding the area near to your eyes. You let the mask stay on your skin for up to 15 minutes. When the time is up, you rinse off with lukewarm water and follow by cold water. The reason for this is the coolness will force the skin pores to close so as to retain moisture in the skin. You wipe your face dry and apply some moisturizer. You may want to watch a Video HERE to learn how to make a homemade face mask to treat sensitive skin.